Stir the flour, salt and black pepper on a plate. Coat the chicken with the flour mixture. Heat the oil in a 12-inch nonstick skillet over medium-high heat. Add the chicken in batches and cook for 10 minutes or until browned on both sides and cooked through. Remove the chicken from the skillet, cover and keep warm. 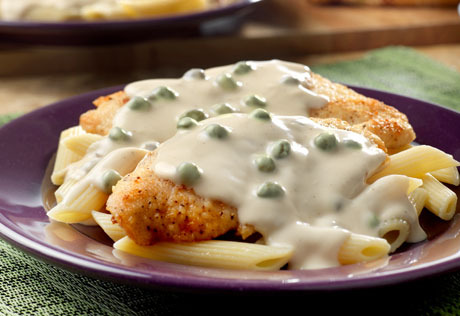 Stir the lemon juice, wine and capers in the skillet. Cook for 5 minutes, stirring to scrape the browned bits from the bottom of the skillet. Stir in the sauce and heat to a boil. Reduce the heat to low. Cook for 5 minutes, stirring occasionally. Serve the sauce mixture with the chicken and penne.